You know it's been a wild and wacky year in politics when the President of the United States has to dodge a shoe at a press conference. The 2008 political year will likely be remembered for its historic firsts, beginning with the election of Barack Obama as president. But that doesn’t mean the past 12 months have been marked solely by high-minded drama and consequential events. In honor of the less lofty moments, the nutty or flat-out bizarre happenings in the political arena, Politico offers its 10 weirdest moments. Shortly before the Iowa caucuses, the former Arkansas governor held a news conference to inform reporters that he was taking a principled stand against negative campaigning. Though Huckabee had an attack ad against Mitt Romney at the ready, he said he had decided to “do the right thing” and pull the plug on the negative spot. But not before first showing it to the assembled media, surrounded by five placards on easels leveling the same attacks on Romney. Ok, so it happened on December 31. But since it was too late to make any 2007 lists and the derisive laughter lasted into 2008, we think it qualifies here. In an attempt to show her familiarity with working class custom, Hillary Clinton stopped by Bronko’s Restaurant and Lounge in northwest Indiana to throw down a few drinks with the locals. But rather than boosting Clinton’s prospects, pictures and video of her downing a shot of Crown Royal whiskey and drinking beers at the bar turned out to be fodder for late-night comics—and for the Obama campaign. Acknowledging the awkwardness of the scene, she said of the ABC and CBS embed reporters covering the moment, "These two young people are really very, very nice but their job is to get something on film that looks really weird, so I try to accommodate them as much as often." Shortly after locking up the party nomination in June, Obama met with Democratic governors as a show of unity. But that’s not what the event will be remembered for. Rather, it was the strange, pseudo-official Obama for America seal prominently displayed in front of the rostrum. The design mimicked the official seal of the President of the United States, with a few alterations. “Obama for America” and the campaign website address appeared on the outside rim of the seal while “E Pluribus Unum” (Out of many, one) was replaced with “Vero Possumus” (Yes we can). The seal, widely ridiculed for its presumptuousness, was quickly mothballed. In an effort referred to by the local GOP chairman as “loony bin direct democracy,” a San Francisco group managed to place a measure on the November ballot that would have renamed the Oceanside Water Pollution Control Plant as the George W. Bush Sewage Plant. The organizers of the effort joked that the sewage plant would stand as an “enduring tribute” to Bush but San Francisco voters rejected the measure by a wide margin on Election Day. The result wasn’t necessarily a show of support for the president—the San Francisco Public Utilities Commission made clear that changing the name would be a costly endeavor. For a time in late August, the left-wing blogosphere was atwitter with rumors that then-four-month-old Trig Palin was actually Bristol Palin’s baby and that Sarah Palin was engaged in a conspiracy to cover it up by pretending to be the mother. The evidence? Sarah Palin kept news of her pregnancy under wraps for a long period of time and a handful of photos where the Alaska governor did not appear pregnant during the period in question. Hardly smoking gun-style evidence, but that didn’t stop the rumor-mongering. It wasn’t until the McCain campaign announced that Bristol herself was pregnant that the whole matter faded from view. 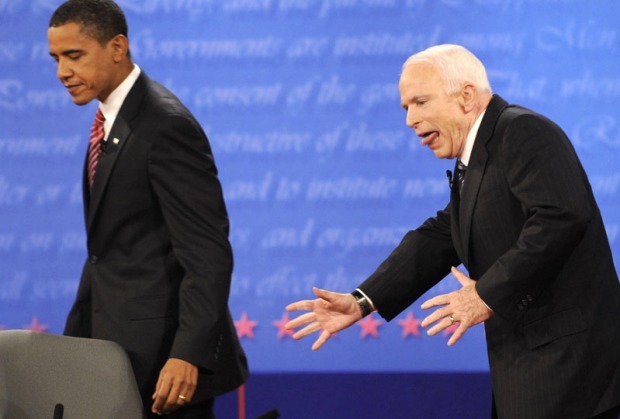 Politicians have a number of different ways of mentioning their opponents, but John McCain’s nails-on-a-chalkboard reference to Obama as “that one” In an October presidential debate ranks as one of the weirdest. McCain was attempting to distinguish himself from Obama by explaining that he had voted against a bill while “that one” voted in favor. It’s possible that McCain didn’t mean anything with the unusual reference, but the awkwardness of the moment led to a variety of interpretations, none of them flattering to McCain. If nothing else, it seemed to betray a surprising level of hostility toward the Democratic nominee. Two weeks after Election Day, the Alaska governor went to her hometown of Wasilla for a customary political event—the pardoning of a turkey ahead of Thanksgiving. What followed, however, was not so light-hearted. Unbeknownst to her, as Palin discussed her presidential campaign trail experience and the state budget with a local TV reporter, several less fortunate turkeys were brought in and slaughtered behind her as the cameras rolled. The episode was YouTube’s most-viewed clip for the week. The president showed some impressive agility in dodging two shoes thrown at him by an Iraqi journalist in December. 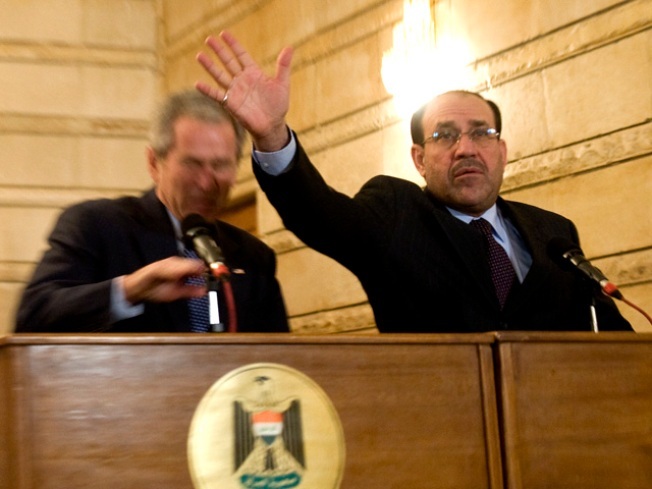 Bush, speaking in Baghdad with Iraqi President Nouri al-Maliki, was interrupted when a man stood up, started shouting and then hurled the shoes. Barbra Streisand has been among the most vocal Hollywood critics of President Bush, but she had to play nice in early December after receiving a kiss on the cheek from the president during an event honoring her at the Kennedy Center. Streisand has called for Bush’s impeachment, but laid off the president that night. “Art transcends politics this weekend,” she said. The 79-page criminal complaint against Illinois Gov. Rod Blagojevich is filled with vulgar remarks and jaw-dropping revelations related to his alleged attempt to sell President-elect Barack Obama’s Senate seat. He’d viewed himself as a presidential contender after winning the governorship in 2002, but much had transpired since then. He had an undistinguished first term, limped to re-election in a solidly Democratic state against a weak field, alienated much of the legislature and was well aware the feds were closing in on his administration on corruption issues unrelated to the Senate seat. In other words, Blagojevich had done almost everything imaginable to eliminate his viability as a presidential candidate. Talk about sunny optimism.